If ANY of your answers are A, don’t go. If some or all of your answers are B, you’d better be really into nature, adventures, and sea cliffs, otherwise don’t go. If most or all of your answers are C, go for it, you’ll have a blast! Note: nearly of my answers would have been B. But it’s cool, because I really dig adventures and also sea cliffs. Thank goodness for that. See the highest visible point, about 2/3 over from the left? Remember that bit when you get to the last photo at the end. 1) How do you feel about driving on the left side of the road? A) I do that already! Don’t I? Oh, wait, no, I’m thinking of the right side. B) Yeah, whatever, that sounds fine! I’m sure I’ll figure it out. It can’t be THAT hard. C) I actually legitimately *do* do that already, I’m from a country where that’s normal. For the record: *driving* on the left isn’t so difficult. 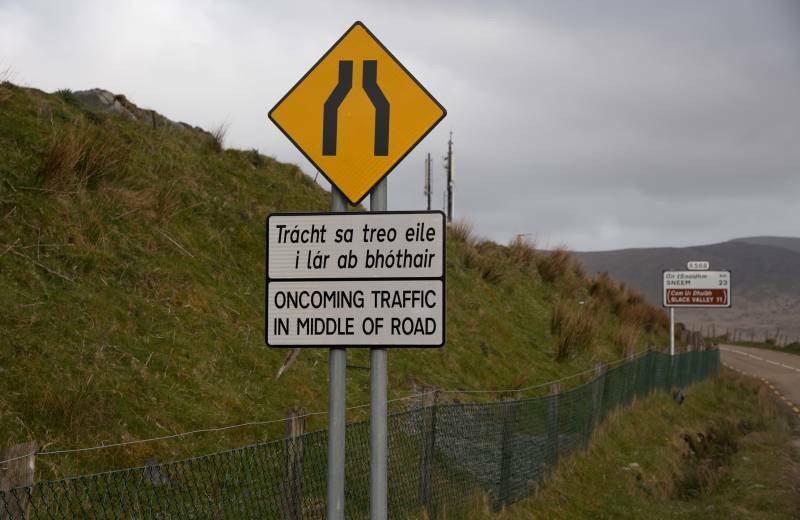 Other things, like responding correctly to mysterious symbols on unfamiliar warning signs, and turning the right way into the proper lane, and looking the right direction before doing so in order to avoid getting creamed by a tour bus, and pulling over to yield to oncoming traffic on single-track roads with no shoulder and stone walls on both sides…. those things are much harder. 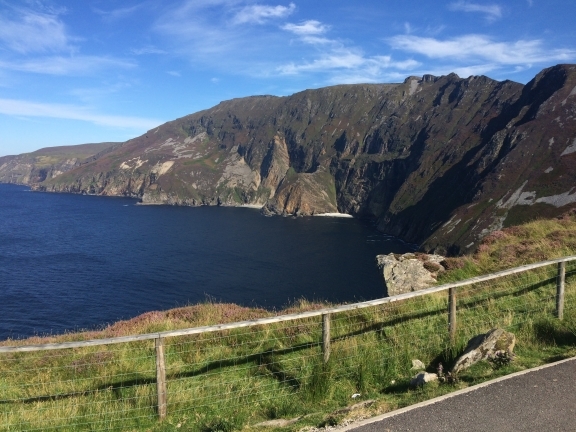 This is the road up to the first viewpoint at Slieve League. 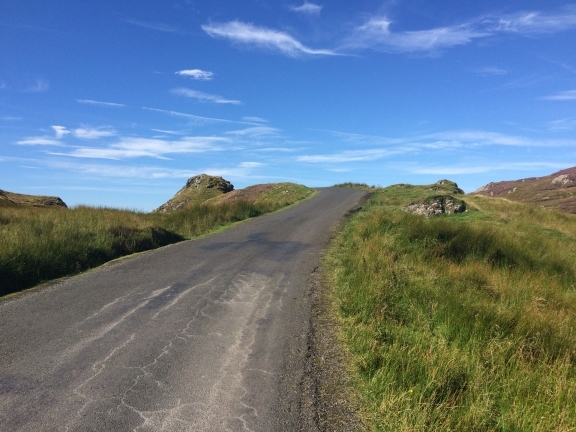 Right after this little hill it narrows slightly and goes around a blind curve with a sheer drop down to the ocean on the left and no guard rail. Fun! I stole this photo from the internet, because I couldn’t take pictures of these signs when I saw them since I was, well, DRIVING. Thanks, Google! A) Absolutely definitely not, can I just, like, take a bus instead? B) …..I mean, if they can do it I’m sure I can do it. Right? Confidential to those who selected (C): did your farm also have frequent sheer drops and sharp curves, a standard posted speed limit of 80-100kph, narrow stone bridges, and regular encounters with double-decker tour buses? I didn’t think so. 3) What are your feelings on hiking in ankle-deep mud on steep boulder-strewn mountainsides with no marked trail? A) Ew. I don’t go hiking to get DIRTY. B) Ew, no thank you, but I’m sure I can find a way to hike around the mud, so I’ll be fine. C) Bring it on! I’ve got fancy waterproof knee-high magic hiking boots and stuff! PSA: no, you cannot hike around the mud, unless you’d like to maybe also hike around the entire mountain instead of hiking up it, in which case just go to the beach, yeah? 4) How comfortable are you with unidentified flying beetle things? A) Eeeeeeeek I hate bugs! B) I prefer not to think about it, so let’s pretend you didn’t just say that. C) I have no fear of creepy-crawly-fly-y things. On the plus side, the bugs are mostly hanging out around the mud, so if you can go around the mud you can avoid them! Oh, wait, see #3 re: going around the mud. 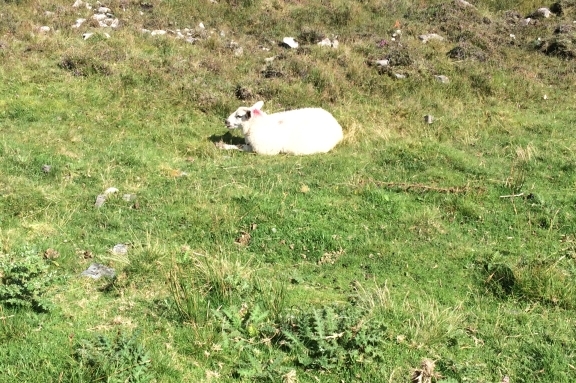 5) What kind of sheep are you (I took a lot of pictures of sheep)? Did you know: you can successfully eat grass while lying down in the sunshine in the middle of a flat meadow, with no cliffs in sight?! HOW GREAT IS THAT?! This is the kind of edge I’m comfortable with. If I fall off this I bump down a gentle slope for about ten feet before coming to rest on a flat surface. I’M KING OF THE WORLD UP HERE! The best grass is clearly the grass juuuuust over the edge of the thousand-plus-foot-drop. Yum. Plus you don’t have to share any of it with sheep (A) or sheep (B)! Those losers. 6) How much do you enjoy hiking? Like, for real? A) I mean, I like going for walks outside, but I’m not sure what you mean by “hiking”? B) I really like the *idea* of hiking! C) I go hiking at least 10 miles every weekend, year-round! 7) How sure-footed are you? B) I fall down all the time, but the thing is I’m used to it and I’m good at landing so it’s fine! 8) Are you afraid of heights? A) Yep, petrified of them, as in, I literally freeze and cannot move. B) Nah, I don’t think so. I mean, maybe? Like, everybody KIND of is, right? But not, like, more than normal. C) Nope, not at all. 9) What level of wind are you personally comfortable with? A) What kind of a question is that? I like flying kites…? B) As long as I have a hood, and maybe a rope or something to hold on to, I love high winds! C) I love the thought of *being* a kite, so much so that windsurfing is my side hobby! PSA: you know how it’s usually windy at the ocean? Well, think about your normal windy beach. 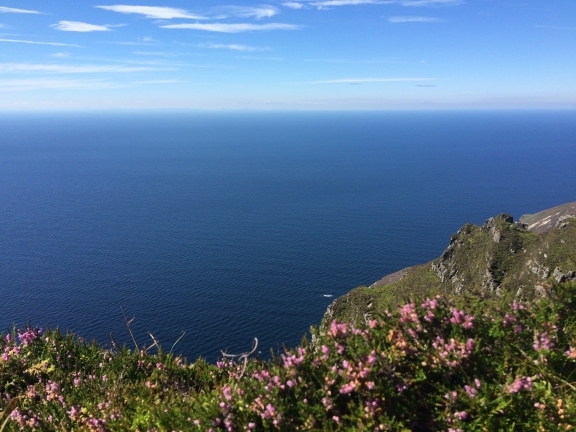 Now imagine you’re 2,000 feet higher and staring out at the unobstructed North Atlantic. It’s windy enough that a) a gust will literally knock you off your feet; b) you won’t be able to hear anything over the howling and your ears (despite the hood you were wearing) will be ringing like you left a rock concert for about half the hike down; and c) if you put down your (not too heavy but also not super light, has water bottles and a raincoat etc) backpack and don’t hold onto it, it will actually blow away (I know because I tentatively tested this while holding on to the strap, and it did its best). 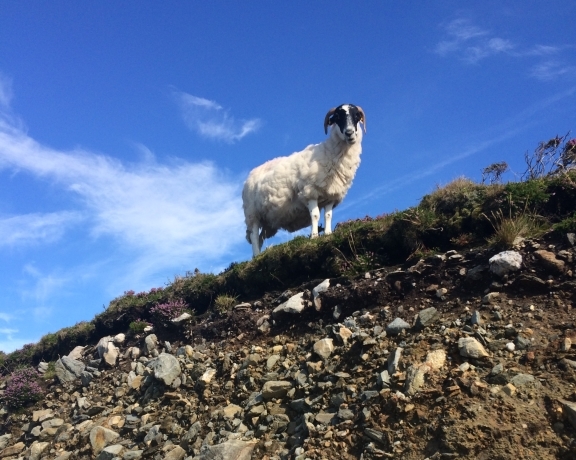 10) Is it worth it to be able to lie down on your stomach in the sunshine on the blooming heather and peek over the edge of a 2,000-foot cliff and realize that you can actually see the curve of the earth and that the waves are so far down you can’t hear them crashing against the rocks at all? This is from that highest point in the first photo. I wanted to take a photo looking down but I really didn’t want to drop my phone into the North Atlantic. B) I mean, probably? That sounds amazing. Final question: would I do it again? Yes, definitely, without hesitation. It was fantastic. And dear mom and dad: don’t worry, I was super careful, I didn’t do anything actually-dangerous, and all the unpleasant bits where I was at all unsure about my footing in the mud were on the not-cliff-side of the mountain. 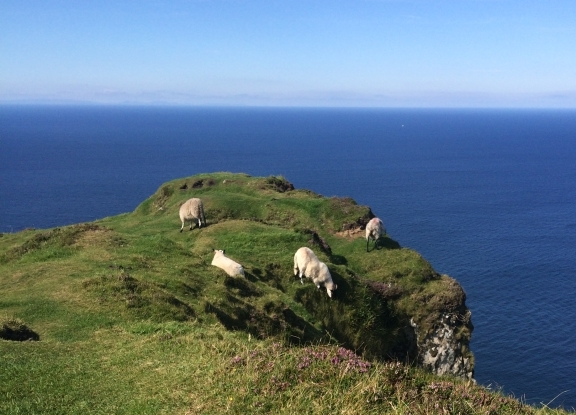 Also, if you’re a stranger who somehow came across this blog and are planning to actually do the hike; if you see Irish signs that gently and politely suggest that the cliff trail is “suffering damage” and you should “consider using the Pilgrim’s Path instead” don’t be like me and go “meh, the Pilgrim’s Path looks waaaay longer and kinda boring, I’d rather go this way and see more views, I don’t mind a little challenge.” Take the darn Pilgrim’s Path. For real. They mean it, they’re just being polite. “The trail is suffering damage” is Irish for “the trail is pretty much completely destroyed/non-existent” and you should really just take their advice. Also, I did this hike on a warm sunny day and I needed long sleeves and a hood for the wind, and I reeeaallly should have had sunscreen too. That said, have fun, it’s totally worth it, and be careful up there! Sounds like you had a lot of fun. BTW, I think those 60 speed signs you were seeing were 60kph (37.5mph), which is still quite fast on twisty narrow roads. I think they've ripped out all the old mph signs now. Ohhhhh good point! I got a little confused because I drove through Northern Ireland for a bit on the way, and all the signs changed from kph to mph, but my rental car display only had kph. Hurrah for surprise math!